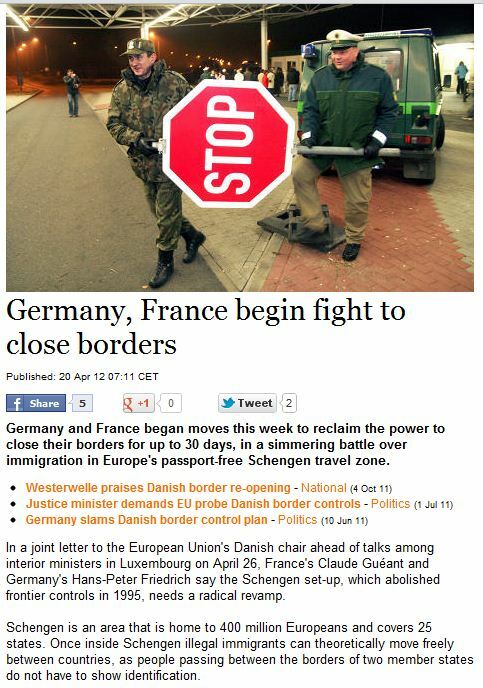 GERMANY AND FRANCE INSIST UPON SOVEREIGNTY OF THEIR BORDERS……. – The Tundra Tabloids……. GERMANY AND FRANCE INSIST UPON SOVEREIGNTY OF THEIR BORDERS……. The EU, being both a farce and a tyranny, is once again showing itself to be a complete and utter failure. Let it fall apart. Previous Post Previous Post BIGOTED OIC ANNOUNCES LAUNCH OF NEW MEDIA WATCHDOG, THEIR NEED TO REINFORCE BRAINWASHING COULDN’T BE GREATER……. Next Post Next Post BREAKING: DANISH FREE PRESS SOCIETY PRESIDENT ACQUITTED BY SUPREME COURT……..